Trinidad and Tobago is highly vulnerable to the impacts of global climate change; particularly rising temperature, decreased precipitation and sea level rise (SLR). It is anticipated that these changes will have adverse effects on the physical environment and economy. There is therefore a need to reduce the risks associated with the expected impacts of climate change on the country by mainstreaming climate change adaptation into development planning. 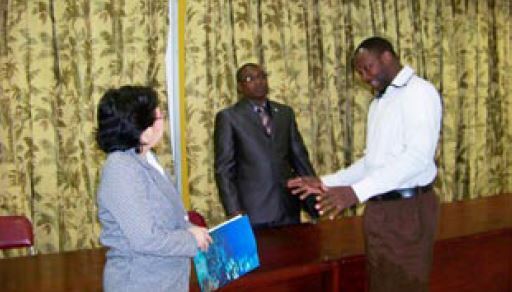 In December 2012, the Government of Trinidad and Tobago signed a technical cooperation (TC) with the Inter-American Development Bank (IADB) to undertake a pilot study on integrating climate change adaptation (CCA) into coastal zone management (CZM) in SW Tobago. The Institute of Marine Affairs is the executing agency. Activities under this project began in April 2013 and are expected to be completed in June 2015. The objective of this TC is to develop an ICZM program that incorporates CCA and disaster risk management using an ecosystem based approach. The lessons learnt from this TC will directly inform the development of the broader national ICZM Policy Strategies and Action Plan. The TC will also lay the foundation for future investments in a coastal risk assessment and management program in Trinidad and Tobago. l-r: Dr. Amoy Lum Kong; Mr. Hayden Spencer, Assistant Secretary, THA; Mr. Garth Ottley Member of the Board of Governors of IMA at the launch. Gap analysis – review of the legislative, policy and institutional information an capacity arrangements related to CZM and climate change in Trinidad and Tobago. Vulnerability and Risk Assessment – the development of climate-related hazard vulnerability and risk assessments of the coastal zone area of Southwest Tobago based on climate variability (existing climatic events) and climate change scenarios. Coastal ecosystem-based climate change adaptation response plan – the design and implementation of an adaptation response plan for coastal ecosystems in Southwest Tobago which included the deployment of an coral reef early warning system (CREWS) on Buccoo Reef and enhancement of a long-term water quality monitoring program. General guidelines for incorporating an ecosystem based approach to adaptation into a national ICZM Policy – produce guidelines that incorporate CCA into an ICZM Policy, including identification of best management practices for adapting coastal economic activities to risk. While Trinidad and Tobago has a National Climate Change Policy (NCCP), it does not specifically address ICZM and CCA on the coast, though it does note the effects of rising sea level and temperature. Research has shown that there is a lack of specific policies to treat with CZM and CCA although various policies address ICZM in a piecemeal and fragmented manner. Moreover, the policies are dated and those that exist are not implemented. In addition, it is important to recognise that ICZM and CC adaptation cannot be dealt with without reference to other policies. In situations where a policy names several organisations with responsibility to implement, the absence of specific provisions on ICZM and CC adaptation can translate into non-action. There is little in existing policies that indicate how the policies are to be used as part of an ICZM plan or for CCA as it relates to the coast. Development plans suffer from a similar lack of specificity as it relates to ICZM and CCA. There are some 20 pieces of legislation that can potentially address ICZM. The multiplicity of laws and policies impacting on coastal areas gives rise to as much as twenty nine (29) institutions having a defined legal and/or policy role. This creates problems such as overlapping jurisdiction, the independence syndrome, and a lack of proper co-ordination of the work of enforcement and management agencies. Key problems confronting State entities with responsibility for aspects of coastal zone management are the lack of sufficient resources, the most important being financial resources and the presence of little or no public awareness of the importance of coastal areas to the society. Public education programs are limited and sporadic and have generally failed to transform attitudes towards sustainably using coastal areas in Trinidad and Tobago. These problems have led to unsustainable utilization of our coastal resources. to the country’s traditions, cultures and economic conditions of Trinidad and Tobago. Promoting rational development and sustainable utilization of coastal resources. environment. Adverse climate changes may thus threaten the sustainability of not only the SW region but all of Tobago. Halcrow, a CH2M HILL Company, was contracted to undertake a study to develop a vulnerability and risk assessment for South West Tobago based on climate change scenarios. The assessment was used to formulate a Coastal Vulnerability Index (CVI) which will identify areas that are at risk to erosion and/or permanent or temporary coastal flooding. The results will be applied to better understand the risk of climate change to the region so that educated decisions can be applied at policy and planning levels. Adam Hosking of Halcrow presenting on Vulnerability and Risk Assessment for Southwest Tobago based on climate change scenarios at IMA’s 14th Research Symposium. In June 2014, Halcrow facilitated a training workshop with key stakeholders on the methodology being applied to the assessment. 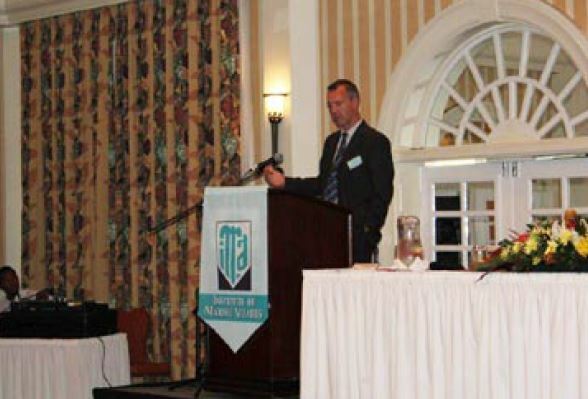 The preliminary result of the risk assessment and CVI was presented at the IMA 14th Research Symposium held at the Madgalena Hotel, Tobago in September 2015. This assessment is currently being finalised. 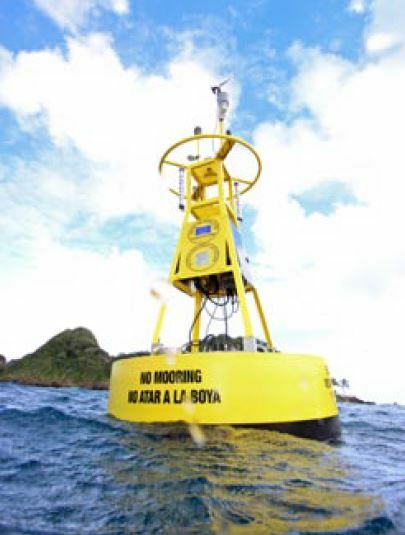 In an effort to monitor and build capacity to adapt to the impacts of climate change, a CREWS buoy was deployed on Buccoo Reef, Tobago in November 2013. The customized CREWS buoy, referred to as Winky by fisherfolks and dive operators, is designed to measure, record and transmit key meteorological and water quality measurements. Meteorological sensors that measure air temperature, wind speed and direction, barometric pressure, rainfall, photosynthetically available radiation (PAR), ultraviolet radiation (UVR), and specialized oceanographic sensors and site specific sensors are also included. 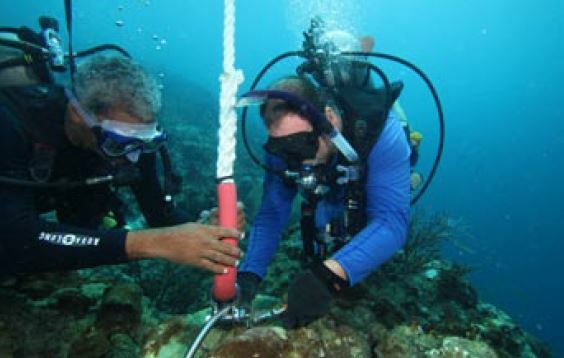 The data collected is available to scientists and other stakeholders to predict possible threats to the reef environment from climate change impacts and from land-based sources of pollution. The data can be downloaded from the link featured below. A tide gauge would be installed during the first quarter of 2015 to monitor sea level. By caribbeanclimate in News on May 11, 2015 .